Ah yes...it must be close to May, because its time for the 10th annual, Blessing of the Bicycles." I've never understood this event but I feel obliged to mention it mainly because it kicks off the, "Bike Riding Season," what ever that means. 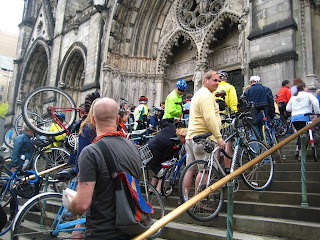 Every year, hundreds of cyclists file into the Cathedral of St. John the Divine and have a Reverend say a few words and sprinkle them with holy water. Somehow this is to protect them from dangers of the open road as the warm weather brings more of us bikers out to the streets...and they say critical mass makes us look silly? 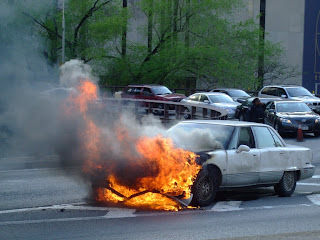 actually thats a photo from I dream Awake, of a vehicle that didn't get enough holy water as it burned up on the entrance to the Brooklyn Bridge. Here is a story on the blessing of the bikes on NY1. How ever you are blessed...Ride Safe. 1) The ride there and back is fun. 2) You get to go into the cathedral. 3) You get to take your bike with you. 4) You get a chance to see other cyclists you know but don't see very often. 5) You are reminded that NYC cyclists are a bubbling melting pot of a beautiful mosaic, etc. etc. 6) You have coffee and danish at the Hungarian place across the street when you're done. "Somehow this is to protect them from dangers of the open road as the warm weather brings more of us bikers out to the streets...and they say critical mass makes us look silly?" I don't count on it for protection from the dangers of the streets. But it can't hurt. I don't know who the "they" are that says critical mass makes "us" look silly, but I don't let critical mass make me look silly, and don't care much for what "they" say. I was being snarky...Thanks John, for setting me straight. Someday I will attend this event, and so will, "they." Glen here, the organizer of the Blessing of the Bikes. The cool thing about this event is that some people take it very seriously, some think it's all a big joke, and some are deeply offended. My feeling is that no matter which of those describes you -- good on you! After the first blessing a reporter asked one of the cyclists if they now felt protected, since their bike had been sprinkled with Holy Water. They replied, "I don't feel protected, but I do feel cared for, and that's kinda nice." I CAN verify that the cathedral is incredibly beautiful (whether you are religious or not) and it's pretty cool to bring your bike inside. (When you consider how many stores, restaurants, apartment buildings,and office there are where cyclists are not welcome, it's extra swell that a cathedral opens its doors for you with your wheels). What's going on with Union Square North?